Haunted Houses in New Orleans, Louisiana are some of the scariest haunted houses in America. Hauntworld.com tries to review only the best haunted houses in New Orleans, Louisiana. When you are looking for simply the best, scariest, haunted houses in Louisiana there is no other place to search than Hauntworld.com which offers our guests the best information to find Louisiana Haunted Houses including the best haunted attractions in New Orleans, Louisiana. There are many haunted houses in New Orleans that claim to the best haunted attraction but only one can truly lay claim to the being the scariest haunted house in Louisiana... 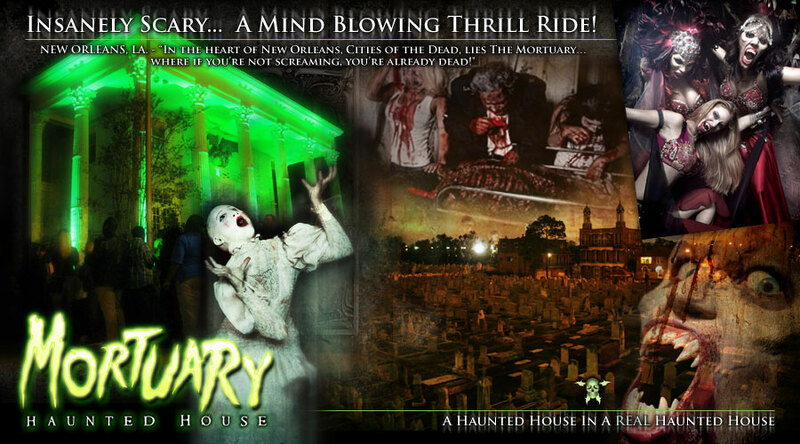 The Mortuary Haunted House in New Orleans, Louisiana. At the very “dead” end of world famous Canal Street lies The Mortuary, a 140 year old Grand Victorian Mansion, former funeral parlor, and crematorium… surrounded by New Orleans’ famed “Cities of the Dead” and sits among more than a million graves in a one-square-mile radius. “Between 1930 and 2003, more than 20,000 funerals took place within its walls, the blood and bodily fluids of the dead swirling into a drain in the embalming room deep in the basement catacombs.” For many years, people from near and far journeyed to this breathtaking building to pay their last respects to dear departed loved ones. Originally built in 1872 by Mary Slattery, the original mansion was intended to be a home for generations of her family. By 1880, John and Mary Slattery had six children living with them in the home. Their son, John Jr, was a Stone Cutter and sexton for the cemetery next door. In October of 1905, the Slattery home was sold to Mrs. Marie Lafontear and William Klein. Marie maintained possession of the home until May 15th, 1923, where the home passed into the custody of PJ McMahon & Sons who turned the property into a grand funeral home. In 1930, the first advertising booklet of the PJ McMahon & Sons Undertaking Company began to circulate. In 1959, a expansion of the mortuary added a specially designed elevator for the discrete delivery of the dead, additional viewing rooms and offices. At its height, the building featured amenities found in only the grandest of mansions such as smoking parlors for the men, private bedrooms and apartments with separate baths for the bereaved, maid service, an on-site cook, dining facilities, chaise lounges for the ladies in their private bathrooms and private drawing rooms. The funeral home was designed to mimic the comforts of home and rivaled all but a few of the grandest of residences of New Orleans. Yet all was not “Victorian Splendor.” It was a full-service funeral home. There was an autopsy room and an embalming room. There was a crematorium onsite, cold storage for the dead, casket storage, casket sales and a flower sales facility. The property was designed to anticipate and take care of every aspect of the funeral business. The mortuary was massively successful. The property was sold again in 1996 to Alderwoods. During this time, many of the amenities of the funeral home were done away with in cost-cutting maneuvers. Business suffered. The cost of the massive upkeep of the 130+ year old building began to take its toll. On March 23, 2004, Alderwoods sold the property to Neil Corporation which owns Aveda’s Spas. Their first task was to gut the property due to its poor condition. All that was left was the wood framing, doors and the staircases of the building. In this process, the CEO of Neil Corp died surrounded by somewhat mysterious circumstances and their board decided to sell the property. The gutted building was listed for sale in 2004 and remained empty and abandoned for three years. During this period, disaster struck. Hurricane Katrina swept through New Orleans in late August 2005 and laid waste to the city. Windows were blown out, the roof destroyed, some water poured into the basement’s lowest areas, but the bones of the structure survived. 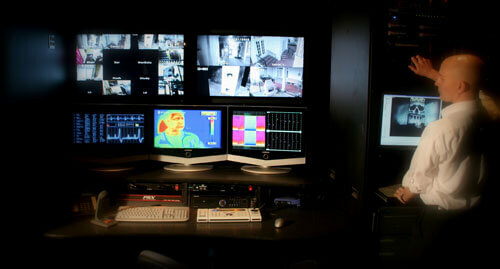 During this time he was approached by a paranormal investigative unit based out of Los Angeles. They hoped to investigate the PJ McMahon & Sons Funeral Home due to its hundreds of reports of strange occurrences over its long history. It seems that many of the souls that passed through the old PJ McMahon building… never left. A phantom woman in white was often seen on the top floor crying for her husband who had long since passed on. Legends told of a tall well-dressed man who appears when he believes people are disrespecting the cemeteries that lie beyond the walls of the home, admonishing the offenders to silence. The spectral forms of two rambunctious children, a boy and a girl, had been known to play pranks on the unsuspecting living. 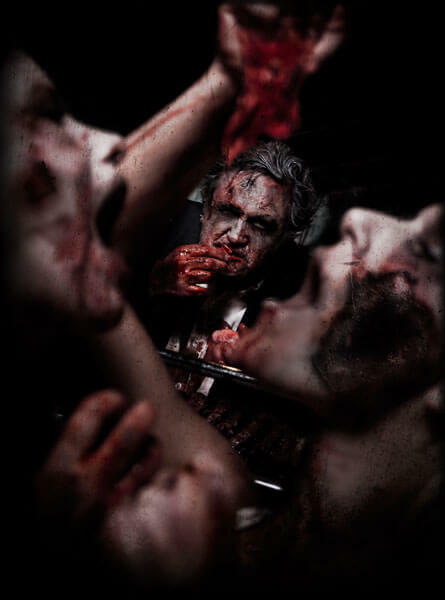 A former enraged mortician was often seen by employees, continuing his bloody work in the bowels of the basement. Footsteps and whispering voices supposedly carried throughout the building when no one was there. 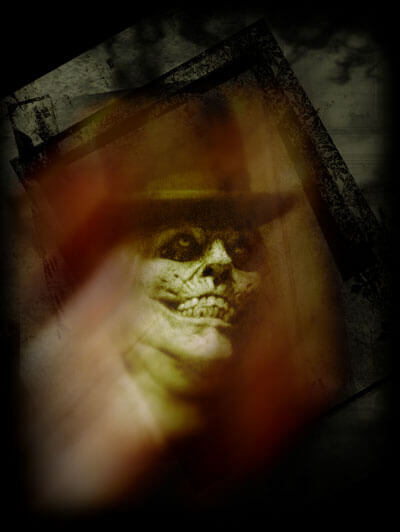 Guests of the Mortuary Haunted House have come up to management asking “how did they do that?” after seeing what they called an unbelievable special effect of a ghost in a tall top hat disappearing right before their eyes, leaving the management just shaking their heads knowing they didn’t do it. Tales traveled far and wide of poltergeist activity, of pieces of furniture moving on their own, while shocked eyewitnesses stared in disbelief. These were just a few of the stories that had reached the ears of paranormal investigators over the historic mansion’s life. This is an actively-haunted, 14,000 square foot, 3-story mansion and is reported to have nine known resident ghosts and documented ghost stories that originate over 125 years ago. Formal successful ghost investigations have been conducted by the Ghost Lab team from the Discovery Channel as well as Dustin Pari from SyFy Channel’s Ghost Hunter’s/GHI just to name a few. Ghost Tours and Ghost Hunting are offered on select nights year round… If You Dare! The Mortuary is unique, world-class haunted attraction because of the realism of the property. “We build sets and bring in props, but 90% of what guests see and experience is real. It is the true nature of the property. It’s elegant and at the same time, intensely scary.” Location, location, location as they say. 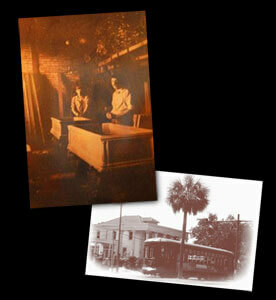 The property is on World Famous Canal Street in a real mortuary, surrounded by real cemeteries. It just doesn’t get any better than this! apart as a portal to the supernatural afterlife is ripped open right before your eyes. The room is adorned with late 1800s style books, tokens, and voodoo masks. Only lit by melting candlelight, the wind swirls as the round séance table floats in mid air. The entranced madam calls for the spirits of the departed and an incredible angry ghostly apparition appears out of thin air over the table. Lightning crashes and everything around you springs to life in poltergeist like fashion. And deep below in a sub-level to the basement is the crypt. Decaying concrete steps wind their way down into an even darker level where the temperature turns cold, the smell of mildew and earth permeate your senses, and you find yourself underground with the coffins and rotted corpses of a forgotten graveyard. Patrons waiting in the queue line above can hear the muffled screams of the terrified guests below them as these poor souls realize they are actually at the same level of the real graves just a few feet away! It’s a thrilling, realistic experience you won’t soon forget! The Mortuary Haunted House represents themed interactive entertainment featuring some of the most cutting edge animatronics and special effects offered today in a haunted attraction. But what brings the fear to life really are the actors. Think of The Mortuary as a theater that is presenting a play. In ordinary theaters, the audience is seated while the action continuously unfolds on the stage in front of them. The Mortuary, however, is a bit like going to a theater in the round with the stage that encompasses the entire theater and having the action sporadically occur all around you, even to the extent of your functioning as an extra in the play. You are the star of the horror movie. One of the really outstanding features of the Mortuary is that though the theme of the haunt remains true to its vampiric roots, the story continues to evolve annually, chapter by chapter. To accomplish this, more than two-thirds of the experience is different each year. The main and top floors of the attraction are recreated as completely new rooms. And the basement gets increasingly more intense. The twisted imaginers at the Mortuary dream up and create some of the mind blowing, interactive experiences in the industry. As a guest you experience this story live. The Mortuary has been featured on The Travel Channel’s "America's Scariest Attractions” and FUSE TV’s Voodoo Music Experience special as a “must see” during the Halloween season. And USA Today says that “Hollywood thrillers can’t beat this haunted house!” It’s a Universal Studios on steroids type experience. The New Orleans Convention & Visitors Bureau touts The Mortuary as the center of all the city’s Halloween festivities in the most haunted city in America! The Mortuary Haunted House attraction is typically open early in September and runs through Halloween. (Visit www.TheMortuary.net for dates) Borne added, "We will also feature a special Flashlight Fear Fest Night where our brave guests will tour The Mortuary in complete darkness with only micro-flashlights to guide their way. And, on October 13th each year, we will host an exclusive Slasher Night with half price tickets and featuring slasher movie anti-heros.” Group discounts are also available if you have more than 15 guests. For More information, dates, videos, hours, special events, and discount coupons, visit the Mortuary online at www.TheMortuary.net or call 504-483-2350. Every year, The Mortuary is "Out For Blood" as they team up with The Blood Center for their annual blood drive. If you the gift of life and donate blood on location at The Mortuary and you’ll receive a FREE VIP Admission to the haunt. The Mortuary is the largest blood donor site in Louisiana. In addition, the Mortuary is used for private Halloween Parties complete with catering, entertainment, and the creatures of the night. The venue is available on nights the haunt does not operate. The Haunted Mortuary, also known as Mystère Mansion when they are not scaring the yell out of guests in the Fall, is a most unique venue for special events for all group sizes and occasions. From private parties complete with a catered dinner and attentive butler service, to screenings, meetings, conventions, receptions, wedding receptions, and celebrations. Your event will be memorable and certain to create a long-standing favorable impression. A custom-made mahogany bar in the Great Hall as well as a catering kitchen and an attentive staff adds a variety of special event options to which the mansion can cater. 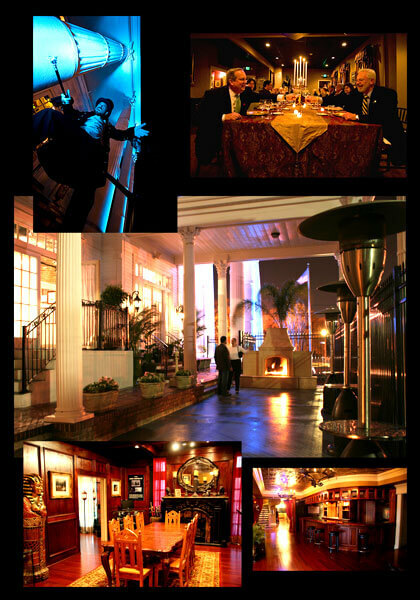 For more information and assistance on creating an amazing event for your group and occasion at the mansion, call us or email your inquiry to contact@MansionNewOrleans.com or online at www.MansionNewOrleans.com. The Mortuary is more than just a haunted house. It’s loaded with great startling scares, plenty of fantastic unearthly atmosphere, a top-notch troupe of actors/haunters in a well organized production, and just a incredible overall live experience. So take a classic streetcar ride from the enchanting French Quarter to the portal of the world famous New Orleans Cemeteries, delivering you right to the steps of The Haunted Mortuary, one of the top Scariest Places On Earth! Over a century ago, Master Ravencroft, a twisted mortician, was trying to embalm his latest client and realized the body was in the process of transforming into a vampire. He experimented with the body, removing the life rejuvenating fluids transfusing them with various types living and dead matter creating many forms of undead creatures. Finally, feeling he has found the secret to everlasting life, he experiments on himself… He needed an endless supply of life-giving blood to continue his ghastly experiments to extend his own life. You see, the Blood was the secret to immortality. Some believe that the rumored experiments of dismemberment and bloodletting continue to this day in mass serial killing fashion by a secret society of morticians known as the “Collectors.” Tall top hats in Edwardian clothing, looking somewhat out of their time, ghoulishly happy to see you is how a few lucky ones have described them. Surgical precision they say, but without anesthetic. Some say they are ancient. Some say they experiment with fear… One thing is for sure, if you meet one of them, RUN! And now a warning... Our Master has gathered a magnificent collection of sirens to assist in his dark mission. “Vampir Vixens” he calls them. Beings who subsist by feeding on the life essence of living creatures, regardless of compassion and mercy. These are bloodsucking demons older then man himself. Tales of supernatural beings consuming the flesh and blood of the living have been found in nearly every culture around the world for many centuries. These seductive creatures are real. They gather their prey with cunning efficiency to serve the master. They feed on fear, desiring extreme violence and carnage, often aroused in the heat of the hunt, leading to uncontrolled slaughter. It’s the price of eternal life, namely the incessant need for blood… Many have entered the dark hallways of The Mortuary, to never be seen again. Those who enter The Mortuary will be tested and pushed to the limits of their sanity! Do you have what it takes to escape?